150Mbps WiFi 2.3G2.7G 802.11 B/G/N Outdoor Wireless Bridge AP Station WDS POE 14dBi Antenna. Within 3 km straight-line distance visual point to point high bandwidth communications the best solution. IEEE 802.11N protocol supports a maximum bandwidth of 150MBps. Very wide frequency (2.3G-2.7G) and Hide SSID functionality, when you point to point communication, To avoid co-channel interference and illegal intrusion to make your communication more secure and reliable. 4 Wireless Mode: Station, Station + WDS, AP, AP + WDS. The products are often used. Point to Point, multipoint wireless communication. Wireless Video Surveillance - Enterprise wireless LAN communication between. Waterproof design, POE power supply within 100 meters range through Ethernet cable, which facilitate the installation of the device away from your house or in open environment. You would have to prepare an extra Category 5e Ethernet copper cable 8 pin to connect POE power supply and bridge. Although we can prepare this cable for you, but you would be charged for extra. You need to have some network knowledge to set up the network, you can ask an experienced friend to help you, also we will try our best to help you to complete the setup. Our network engineers will be happy to complete the settings for you before sending the packages, but you will also be charged some tips for their kindness. IEEE802.11b: 1/2/5.5/11Mbps IEEE802.11g: 1/2/5.5/6/9/11/12/18/24/36/48/54Mbps IEEE802.11n: 1/2/5.5/6/9/11/12/18/24/36/48/150Mbps. IEEE 802.11b, IEEE 802.11g, IEEE802.11n IEEE802.3, IEEE802.3u. 1 X 10/100 BASE-TX Cat. Station + WDS, AP + WDS, AP, Station. Adjust Able Channel Size Support increase channel capacity or increase throughput. 14dBi Dual-Polarized Panel Antenna V30 H30. 64/128-bit WEP, WPA, WPA-TKIP, WPA-AES, WPA2, WPA2-TKIP, WPA2-AES. Passive Power over Ethernet (pairs 4,5+;7,8 Return). Five wire remote power supply (POE), 10 24V. IP Code (Ingress Protection Rating). Please notice that this item contains Only One Bridge packages, but the Bridge function can only be accomplished by using at least two. If you only aim the AP or CPE function, one Bridge package will be definitely all right. International Buyers - Please Note. These charges are the buyers responsibility. Tips1: This pictures is D-LINK inc 20dBi panel antenna, Detailed Size on picture; So please do not believe other sellers of false data, one 15CM 15CM small antenna, the gain is 20dBi or higher. Tips2: This picture reflects the intuitive antenna gain and Beamwidth relationship. You can clearly see, the higher the gain antenna corresponding the Beamwidth is smaller, can be transmitted to longer distances; but under the same distances coverage from the smaller; So please do not blindly select the high-gain antenna, according to You need to choose the right antenna. If you have any questions about the item please ask a question before purchasing. I will be more than happy to work with you to make things right. 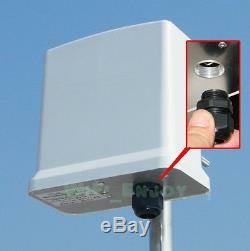 The item "Mars_R2414N 150Mbps Wireless Outdoor Bridge AP Station WDS Router 14dBi Antenna" is in sale since Sunday, July 29, 2012. This item is in the category "Computers/Tablets & Networking\Home Networking & Connectivity\Wireless Access Points". The seller is "wifienjoy" and is located in default, default. This item can be shipped worldwide.